Any company that uses drivers as part of their operations is at risk of negligent entrustment charges for the actions of their drivers while driving on company time. 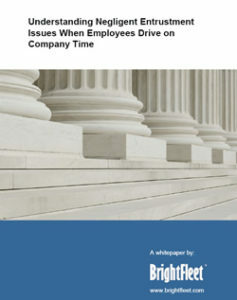 “Understanding Negligent Entrustment Issues When Employees Drive on Company Time,” describes the liability that lies in entrusting employees to drive on company business and ways in which managers can work to mitigate the threat of exposure to their company’s financial health and reputation. The average business driver will travel our nations roads at eight to twelve thousand miles more a year than the rest of us, making them more likely to cause, or be involved in, a motor vehicle accident. Companies and their owners who think they’re hiring a well trained, top quality driver, simply by looking at his or her resume, may be held accountable in the event their driver causes an accident that could have been prevented. “Understanding Negligent Entrustment Issues When Employees Drive on Company Time” is intended to assist business owners and CFOs in understanding the relationship between company and driver and ways in which they can protect their assets – both financial and human. Negligent Entrustment White Paper | November 2013. (pdf, 10 pages, 8MB, Rev.2).